The Capita Outsiders is best compared to the Capita DOA. It offers up more camber and an even more technical ride that many mountain freestyle riders will really appreciate. It provides a springy, turny fun mountain freestyle ride and I had a really good time. I wouldn’t say its for everyone like the Outerspace living is but some will really like it. It’s really improved a lot since the first time I rode this and the only place it’s not fun is in hard snow and in powder. Flex: The Capita Outsiders has a medium soft flex at the tip/tail and a more medium flex in the middle when it comes to riding on snow. Sizing: The 156 felt fine for my size 9 and probably would have no problem with up to a size 10 with most boots. I think the 158 could handle a little bigger than 10 US like a 10.5 but I wouldn’t push it too much past that. On Snow Feel: The Capita Outsiders is a bit locked in and although not quite like camber it’s still a bit more catchy and not the easiest board to skid turns with. It has a very capable springy camber feel that isn’t ideal for the beginner to an intermediate rider in this day an age. When I first started I would have killed for this little bit of early rise in the nose/tail but nowadays it wouldn’t be cool for me to recommend this to anyone except advanced to expert riders that know how to handle mostly camber. It’s not a super aggressive ride but it is more on the technical side of things for sure. Edge Hold: My one personal complaint and for me, I would have liked a little extra grip in the hard stuff but not everyone likes disrupted side cuts and it was really fun in the soft snow. Turn Initiation: Pretty fast for the waist width but I did mainly ride it with Strata’s that are pretty responsive. When I put on the Superpro’s that are like Contact Pro’s I felt the response was a touch slower edge to edge. It’s medium bordering on Med/Fast. Turning Experience: The Capita Outsiders is a super fun ride to turn. It really surprised me at how much fun it was to make pretty much any type of turn. It felt really smooth and springy. Carving: As long as the snow is soft this almost all camber twin really pops. It doesn’t drive as well at higher speeds as let’s say the Signal Disruptor but it sure carves well. Speed: Even though the flex feels more buttery and a bit more mellow the Capita Outsiders seems to be about the same or even a little better. Uneven Terrain: This is where the Capita Outsiders does a lot better than it used to. 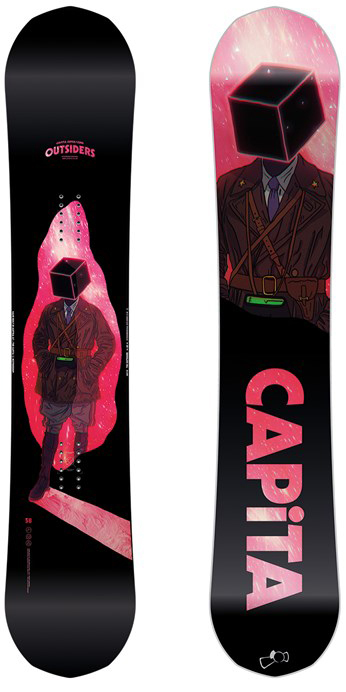 Over the last few years, Capita has transformed the boards’ ability to handle uneven snow of all kinds. Little micro bumps are soo much better with the Outsiders and big bumps are very doable. Powder: Put the Outsiders away when there are more than a few inches of snow. It’s got a little flat/early rise at the tip/tail but just a little. That combined with a centered stance makes it for a cartwheeler in the deep stuff. Still, it’s at a reasonable price if you want to quiver up with something like the Navigator when it get’s deep. Buttering: I was surprised at how easy this was to butter compared to the older model I tried in 2014. It took a little more work than the Outsiders but it was still doable and very fun. The Outsiders easy flex in the tip/tail compared to the rest of the board so it was fun. Switch: Just a touch shy of an asymmetrical twin and very easy either way. Jumps: I liked the pop of the Capita Outsiders better than all the other twins in their line. It really had a smooth easy spring to it and it ollied well. It also seems like the kind of board that can handle a good bit of air. It’s great for borderline big but excels at medium. Jibbing: Not the kind of board I’d personally like to jib with but as the flex softens up it can be more comfortable. Pipe: I had a little time in the pipe and it was nice and soft. It drove really well from wall to wall and I could lap a soft pipe all day with this board. As it get’s harder I’m not sure if I will though. If the edges could be sharpened well this could be a lot of fun. So all in all the Capita Outsiders has a slightly tweaked old school camber feel that might not have the universal appeal of many hybrid shapes but it will appeal to many riders that know and love camber. So it’s been a while since we tried the Outsiders but based on all the changes to the core, side wall and top sheet over the years we are pretty sure the 2018 Capita Outsiders improved just like the other boards we recently tried. Conditions: Cold Hard Colorado Snow with a little soft snow on top in some places. Approximate Weight: Felt almost light and we would say it’s on the light side of medium. Flex: The model we tried felt medium bordering on Med/Stiff throughout the board. On snow the mostly camber with a touch of flat camber profile doesn’t like to let you butter unless you are a strong rider and know how to butter camber boards. It’s more for those that like to ollie, carve and bomb. The 2017 and 2018 Capita Outsiders has a lot of improved tech that makes this a more doable board for those that like to butter around. Also it’s going to give the board a more dynamic flex. Still if you want buttery and playful then go with the Thunderstick. On Snow Feel: So the Capita Outsiders felt like it wasn’t much different from most aggressive camber twins we have ridden in the old days. There isn’t much hybrid in the hybrid camber shape and that is why we call it mostly camber. There is only a little bit of flat before the tip/tail. Capita calling it New Age Camber is perfect. It’s pretty locked in just like camber and we didn’t really feel like it was any more forgiving than a traditional camber board. So basically there is consequence if you don’t know what you are doing or you fall off your game. Turn Initiation: The Outsiders has a good spring from edge to edge for quick turns and it goes where you want it pretty fast. Not bad for those that know how to turn and need it to turn super quick in tight spots. Turning Experience: The Capita Outsiders is pretty fun to turn It springs nicely from edge to edge from short to wide radius turns. It likes someone who understands the technical aspects of turning and if you do it’s a pretty fun overall experience. Skidded Turns: Not a good idea to skid turns with this unless you are a good rider. It’s locked in aka catchy so find another board if that is how you turn. Carving: This is a blast to carve regular or switch and we really liked this here. Even with the flat at the tip/tail it didn’t seem to mess with the arc of the turn like it did with the DOA and it felt good. However our only complaint was we’d like to see a little more grip going on with the edge hold to make it a superior carver for all conditions. Powder: We had no powder but can’t see this doing that great with all that camber going on. It’s even worse than the DOA. If you like a camber twin in powder you will probably like this a little bit better but most who are use to some rocker going on in the shape will find this a lot of work. 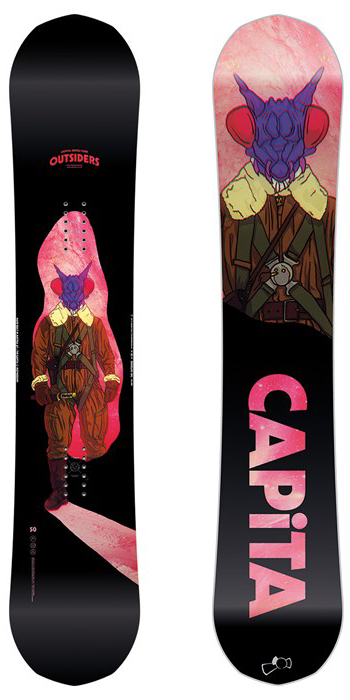 It’s one of the last Capita boards I’d grab off the shelf on a powder day. Speed: Really fast and feels almost like the Capita Mercury when pointing it. The Capita Outsiders doesn’t have the higher end base but it’s pretty good for this price point. Uneven Terrain: A little rough in the sloppy snow we came across and it doesn’t feel like there is much dampening going on in the board. Even with the Union Atlas which is a damp binding it felt angry on the joints. The 2017 and 2018 Capita Outsiders should be easier on uneven terrain than the model we tried thanks to a new core, top sheet, sidewalls and other flex/dampening tech throughout the board. Edge Hold: We wanted more. The Outsiders feels like it’s made to be a for people who want a mountain friendly true twin so why not put in the Death Grip side cut as well. It would give it a little more grip in those medium to hard conditions lot’s of people often ride in. Switch: Almost perfect either way like a true twin should be. Jibbing: Both Peter and I were intimidated by the Outsiders for jib park riding and didn’t even go in there. We wanted to stay gold like Pony Boy and be Jib Park Outsiders when it came to the Outsiders. Pipe: The only complaint about the Capita Outsiders is the edge hold but everything else about the ride is outstanding in the pipe for an accomplished pipe rider. It’s not forgiving but if you know what you are doing you will like it as much or more than a traditional camber ride. Jumps: Really good pop off the tip and tail and I think that little bit of flat helps it pop more than many true camber boards. We only hit a few small to medium kickers but the Capita Outsiders had lot’s of rewarding spring off the lip. If you want to go medium to big then this is a very fun board to do it with. Just like in the pipe is it’s not forgiving so you must know what you are doing. All in all its not a bad board but comparing this board to the 2017 and 2018 Capita line we all preferred the Outerspace Living if you want something more forgiving and well rounded for all conditions….especially powder. If you have another board for powder it could be a great good condition daily driver for a technical rider that loves to turn and get air. We try to get as many images of the Capita Outsiders, but forgive us if they're not all there. TheGoodRide's review of the Capita Outsiders is spot on based on my experience with Capita Volcom Stone (same board different core). I would add that it's average in powder and below average in uneven terrain (tracked out pow) based my experience last weekend up at Copper (2 ft. of snow last 7 days). 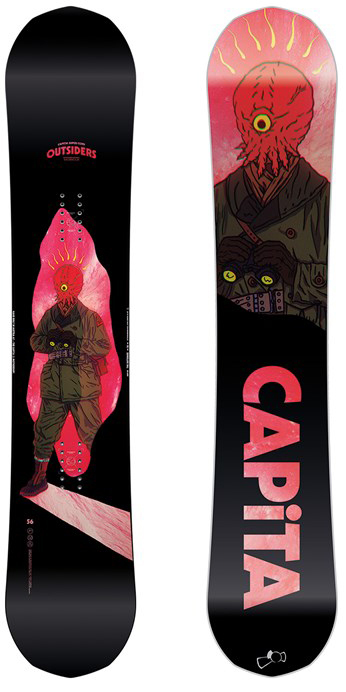 I strongly advise Capita to dump the radial sidecut and add Death Grip tech.